Northwest Geothermal LLC was established in 2009. 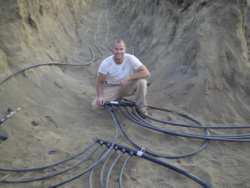 Our Employees currently have over 17 years experience in the geothermal industry. We have the ability to complete projects on a commercial and residential scale. What makes NWG unique is that we will work with your current mechanical contractor to enable you to reap the savings and comfort that a geothermal system can provide. NWG will grow to keep up with the demand for business while maintaining professional service and that hometown business attitude. We sell the WaterFurnace line of water source heat pumps, but will install a loop for whatever manufacturer you decide. Provide our clients superior support and show how you can increase your comfort while being kind to the environment.